Years ago, when I first met Kees Kaldenbach, I was impressed by his knowledge of the 17th century Dutch Masters, in particular Jan Steen. From 2015 on I had the pleasure to work together with Kees. We worked not only in art museums but also during tours in Amsterdam. Kees is a very good colleague, who knows how to inspire not only private, but also more extended groups. His enthousiasm and impressive knowledge is one-of-a-kind. He knows how to look at art and is capable of showing this to his guests. In this way you’ll have an experience you won’t forget. I surely recommend Kees to be your next guide or tourleader. Francis N.: “Kees is outstanding… he has a very rare gift among any the great number of professional tour guide we met in our lifetime… in presenting a deep and very specific art history knowledge, and in combining this with passion and and easy going presentation. Summer, 2007. My husband and I travel the world to stay alive — to see with new eyes and stretch our minds. We love museums and fine food, sometimes stopping at out of the way Michelin-starred restaurants. With Drs. Kees Kaldenbach we had the best of both worlds. During the day we took a car trip to the Kröller-Möller sculpture garden and fine art museum, where we would certainly have missed the hidden staircase leading into the astonishing Jean Dubuffet’s Jardin d’Email without him. Inside the museum, he gave us a humanities course on Impressionist painting, our favourite kind of art. Later that day we drove to a picture-perfect village between Utrecht and Amsterdam, boasting a fine restaurant with one Michelin star, and there the three of us enjoyed an exquisite meal to end a perfect day. I am sending you the details for Kees Kaldenbach. He is one of the few guides in Europe that I am confident can provide you with the kind of experience you have got used to with me. Like me he is wildly overqualified to be a guide and should be doing something else. That is his secret. You must book him to take you around the Rijksmuseum and the Van Gogh museum. He will tell you you have to start early. Do it! He’s worth whatever his fee is! Trust me on this! Kees Kaldenbach was brilliant. I’m sure that he could have given us a dozen different tours of the Rijksmuseum, given the breadth of the collection. But, he asked our interests and tailored a brilliant and insightful tour to our principal interests. Response after Tour, 29 March 2017. Kees Kaldenbach accompanied a Samuel Courtauld Society visit to Amsterdam and Haarlem in May 2017, to support a Professor from The Courtauld Institute of Art. His organisation was extremely efficient. He was well-informed about the history and culture of the Netherlands across all historical periods, communicating a wealth of up-to-date information in a lively and accessible way. The Samuel Courtauld Society is the world’s foremost art history university (alumni are found as directors in foremost art institutes worldwide) as well as presenting a collection of fine art in their London, England museum. Kees热情洋溢的讲解和他对阿姆斯特丹学派的知识让我们非常享受这次游览！No doubt that Kees guides professional tours. Kees导游是非常高的专业水平。But if you have specific interests or requirements on the area or Amsterdam School, please tell and hire Kees. He is able to address your needs in a way that no others could do better! Dear Drs. Kaldenbach: Again, we thank you for the terrific tour of the Rijksmuseum. We very much enjoyed and appreciate your unique insights, especially those of Vermeer. As you recommended, we will of course see the Vermeer „Art of Painting” in Vienna on Monday. Upon our next visit to Amsterdam, we would very much look forward to your guiding us into your insights of Van Gogh as our next lecture from Professor Kaldenbach. A most enjoyable and memorable morning!! Very Best Regards; Brent, Sally, Heather & Scott, James. Kees Kaldenbach is one of the most exceptional museum guides we have encountered in many decades of travel. He has a remarkable ability to enable the viewer to understand how it is the viewing certain paintings greatly enriches one’s life. Kees joined us for 3 days. The first was to the Rijksmuseum, the second the to the Van Gogh Museum, and the third to the Hague to visit the Mauritshuis and Gemeentemuseum. All three experiences were most memorable. He has a rare ability to convey vast scholarly knowledge in a way that is immediate and compelling. We spent several hours with Kees Kaldenbach. We traveled to Rotterdam (for personal historical reasons) by train for the day. Strong ability to convey the history of Amsterdam and the Netherlands along with hearing his perspective on Amsterdam today. Had a wonderful walking tour, boat ride and art museum visit with Kees. I don’t think I will every go to an art museum again without having a guide like Kees – he made the art accessible and the history come alive. Highly recommend him for an art, architecture and/or history tour. Traveled with our 17 year old son who thoroughly enjoyed him. Kees arranged a day trip for me to view the Deltaworks this week. He did a great deal of research on this enormous project by The Netherlands that spanned 40 years to hold back the sea. I contracted with Kees to spent a half day walking the city of Amsterdam and enjoyed his great knowledge and obvious love of the city. Can’t wait to bring back my wife to enjoy Kees and North Holland again. Drs. Kees Kaldenbach is a renaissance man and scholar – his tour of the Rijksmuseum was one of the best museum tours i have ever had and i have toured museums with guides for years. what makes him special is that he not only has studied the works and can address any spontaneous questions but he also knows how to read his audience. He is the first guide that I have had that realized when i was tired and could use a cup of coffee before i had to ask – wow! We booked a 3 hour private tour of the Rijksmusem to help the children learn about Dutch art and history in a more interactive manner than an acoustic guide and I can not wait to return and have him teach us about Van Gogh. This is a gem of a tour – you will not be disappointed!! Preparing to visit the “Vermeer and the the Masters of Genre Painting: Inspiration and Rivalry” exhibit that is currently showing at the National Gallery of Art in Washington D.C. tomorrow. Of course, I needed to know how your study of Vermeer was progressing, recalling the time we spent with you. Wonderful to know that you appear to be well and are continuing to shed more light on this phenomenal artist. Please know that my husband and I still refer to your Vermeer lecture as one of our most inspiring travel experiences. Thank you again for the work you have chosen to share. Η τουριστική ξενάγηση με τον Κέϊς ήταν μοναδική. Δε έχω γνωρίσει πιο ειδικό στον τομέα του. Έχοντας κάνει έρευνα στους πίνακες που εξηγεί, γνωρίζει άψογα την ιστορία τους. Η εμπειρία μου έχει μείνει αξέχαστη! The tourist tour with Kees was unique. I have not met any other specialist in his field of art history. Having done his research on the paintings he explains, he knows their history impeccably. My experience has been memorable! Al Кейс ведёт туры очень познавательно и очень увлекательно. Пол дня пролетели как пять минут. Его рассказы увлекут всех туристов: от самых высоких профессионалов и интеллектуалов до самых маленьких детей. Кейс ведёт туры по Амстердаму, Гааге и всей Голландии и занимается этим уже больше 20лет. Мы были на разных турах по всему миру, и Кейс нам особенно запомнился. Kees conducts art tours – very informative and very exciting. Half a day flew by like five minutes. His stories will enthrall all tourists: from the highest professionals and intellectuals to the youngest children. Kees conducts tours of Amsterdam, The Hague and the whole of Holland and has been doing this for more than 20 years. We were on different tours around the world, and that of Kees was especially memorable to us. A tour [in Delft] with Kees Kaldenbach is a true discovery! As an art historian who works as a guide, I wanted to increase my knowledge about the city of Delft. A walk there with Kees showed his work is invaluable! Kees knows all places in the city related to the life of Johannes Vermeer, as the history of numerous historic buildings and monuments. His vivid way of speaking and his enthusiasm have created three amazing and very instructive hours in this beautiful city! His private art tour is highly recommended for (art) historians, but also for all those interested in history, art, culture and Dutch heritage. Touring with you was like being friends with the top curator of a major art museum. Your mountain of knowledge allowed you to zig and zag with our questions and flow seamlessly back into your captivating analysis. Thank you for engaging each and every family member. It was a delight to be with you, and we feel lucky to have had the experience. What a great tour! He made it so interesting and gave us information that we would have never known going on our own. I had my 11 year old and 20 year old with my husband and I and they were both enthralled the whole time! We highly recommend! In the Mauritshuis, I was guiding four clients. A lady was keenly eavesdropping and I invited her in for the next short subject, a talk about the Goldfinch by Fabritius. A remarkable scene in the Mauritshuis, September 2018, in front of the big Rembrandt, Anatomical Lesson with Professor Tulp. You started out with us three but within no-time you commanded the attention of the entire room with 20 other visitors. This shows your outstanding street credibility as a talented senior fine art professor! Thanks for the added visit to the Mondrian paintings in the Gemeentemuseum. August 2016. We would be very pleased to write our comments. I wanted to also send a note of thanks. You had a magical way of bringing the paintings to life and creating an interesting story that left us wanting more. You made a significant impact on Hannah. She shared at dinner tonight that she misses you. We are retelling stories already. Thank you again. Dear Drs. Kees: “I cannot thank you enough for opening our eyes to the wonders of your lovely country and the 3 greatest museums in the Netherlands. You not only told us how Vermeer must have used the Camera Obscura as a tool to paint his masterpieces, you allowed us “an actual glimpse into the Camera Obscura” where everything is more clear and a bit brighter as you taught us to view the Vermeer’s, Rembrandt’s and indeed all art with a more practiced eye! Thank you again, for making our journey a once in a lifetime experience and for your sense of humor and professionalism which contributed to everyone’s enjoyment and 100% pure fun. We traveled on to the Mauritshuis at De Hague and did indeed view the “Girl with the Hollow Silver Ball Earring” as well as “View of Delft”. For a few minutes, we considered traveling to Delft to compare the picture with today’s Delft, but were soon advised of the unsuitability of this venture….the city cannot accommodate a coach as it’s lanes are too narrow and, of course, the time constraints. Perhaps next time. After lecturing in Atlanta, Georgia: „We wanted to express our gratitude for the insightful lectures you gave on Rembrandt at Oglethorpe University Museum of Art in honour of our celebrating his 400th Birthday with the special exhibition: “Sordid and Sacred: the beggars in Rembrandt’s etchings”. Your skilful presentations captivated our record-breaking audience. These fine lectures were able to be appreciated on several levels from novice to professional. Your lectures have a rare quality of being soundly based on your thorough study of Rembrandt, mixed with your keen, first-hand observation and your quick, fluid creative assessments and solutions to visual questions. Above all you are highly attentive to your audience by involving them into your lecture. Kees Kaldenbach is the most interesting art guide I know. I did several tours with him, he is really inspiring and one of the best educated art historian in town. 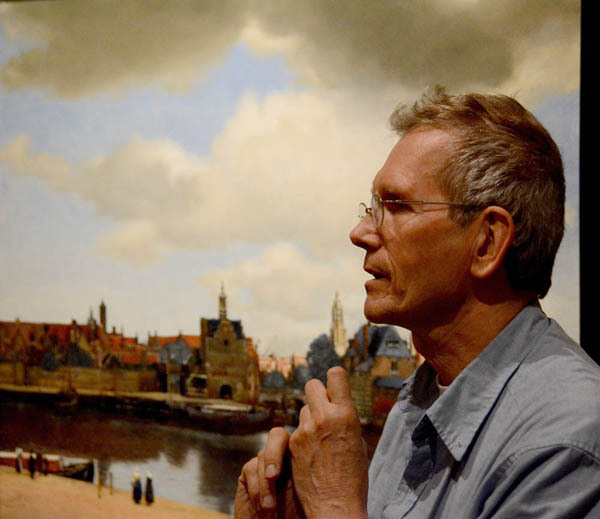 He specialises in Johannes Vermeer, but going out to into towns for a tour is also nice. His knowledge and overview are excellent and besides that he has a great sense of humour. Never a dull moment with Kees! Many thanks for your recent tour of the Rijksmuseum. You have a profound knowledge of the paintings which we saw and communicated that knowledge in a lively and enlightening manner. You brought out many fascinating details which most would overlook. The tour was a memorable event and a high spot of our trip to the Netherlands. Bewertung Tour: „VIP Führung Reichsmuseum mit Kunsthistoriker“. Eines vorweg: diese Führung war nicht nur für mich als Erwachsene sondern auch für die 14 jährigen Mädchen so ein wunderbares Erlebnis, dass wir immer wieder davon sprechen und sogar schon in ein Museum in Innsbruck gegangen sind, um unser „Wissen“, welches Herr Drs. Kaldenbach uns vermittelt hat an den Gemälden „auszuprobieren“. Das Reichsmuseum ist ja viel zu groß um in ein paar Stunden alles zu sehen, aber was uns gezeigt und erklärt wurde, war so lehrreich und umfassend, dass man es in einem Tag oder einer Woche im Museum ohnehin niemals erfahren hätte. Und so bleibt diese Führung mit Drs. Kaldenbach ganz was Außergewöhnliches. Was mich besonders beeindruckt hat, seine Art, wie er es verstanden hat auf Jugendliche, die sich ja noch nicht so in dieser Welt befinden bzw. überhaupt schon was davon zu wissen, einzugehen und dazu möchte ich ihm meinen Dank und Respekt ausdrücken. Ich wünsche mir viele solche Führungen, wie ich sie mit ihm in Amsterdam erleben durfte!!! Ich kann nur jedem empfehlen, wenn er wirklich was erleben will, machen Sie es wie wir und buchen sie Drs. Kaldenbach. Und Herrn Mannheimer (siehe Kaldenbach web site) werden wir auch in Erinnerung behalten, der regt auch zu intensiven Diskussionen an!! Firstly, I would love to thank you again on behalf of Shiho and I for your lovely tour this morning. We both had an absolutely wonderful time, learned lots of interesting things, and greatly appreciated your expertise. Thank you again and hopefully the next time we are in Amsterdam we will be able to meet once more! Great to meet you and again our thanks for a wonderful day in Amsterdam with you, especially getting to know Vermeer with your amazing knowledge, we found it all quite fascinating. Thank you. Drs. Kees, Thank you. You were very knowledgeable and we truly enjoyed the experience of seeing the museums with your expert guidance. Not only that you made it fun and funny. We would and will recommend you to anybody. My wife and I engaged Kees for an all-day visit to the Kroller – Muller museum (it was an amazing day). We were so happy with him that we asked him to show us the Vermeers and other outstanding Dutch artwork at the Rijks Museum. Kees has an extraordinary depth of knowledge, his English was perfect, he conveyed his expertise in an entertaining fashion, was a pleasant companion, and did a great job optimizing our experience based upon our interests and time we had available. We have had many guides around the world (including a number of art experts), but none were better than Kees. Музеи это не всегда интересно. Особенно когда в них заложен слишком большой объем информации рассчитанный на лимитированное количество времени. Благодаря Drs Kees Kaldenbach, великолепному гиду и искусствоведу (! ), всего за 3 часа мы смогли посмотреть все самые главные картины голландских художников, а также узнали о культуре и истории этой прекрасной страны. Интересные факты о художниках и их работах, рассказы о картинах, о который даже работники музея обычно не рассказывают (и о которых нету возможности послушать через плеер музея) все это лишь мелочи, добавляющие в поездку и поход в музей больше вдохновения. А еще Drs Kees Kaldenbach прекрасный собеседник. За небольшой перерыв на кофе и кусочек пирога с кремом нам удалось узнать чуть больше о нашем гиде: помимо невероятных знаний в искусстве и заворажительных историй, можно похвастаться, что его исследования о картине “Gezicht op Delft” Вермеера (J. Vermeer) используются искусствоведами по всему миру! Спасибо большое! Это было незабываемо! Museums are not always interesting. Especially when they contain too much information for a limited amount of time. Thanks to Drs Kees Kaldenbach, a wonderful guide and art historian (! ), In just 3 hours we were able to see all the most important paintings of Dutch artists, as well as learned about the culture and history of this beautiful country. Interesting facts about artists and their works, stories about paintings, which even the museum staff usually do not talk about (and about which there is no way to listen through the player of the museum) are all just trivia adding to the trip and going to the museum more inspiration… and beauty. Over a short break for coffee and a slice of apple pie, we managed to learn a little more about our guide: in addition to incredible knowledge in art and fascinating stories, one can boast that his research on the painting “Gezicht op Delft” by Johannes Vermeer is used by art historians all over the world! Thank you so much! It was unforgettable! You need to look no further to find a fantastic tour guide/art historian. My husband and had Kees for two mornings at the Van Gogh Museum and the Rijksmuseum. Kees is a remarkable resource for making these museums come to life with rich details backstories as well as his incredible depth of knowledge of art and history. My husband, who is more of a fishing/hunting type than art type, was surprised and delighted at how engaging Kees was and how much he enjoyed our time in the museums. Although I have studied art history, I came away with many new insights and a new appreciation of works i have enjoyed over the years. We give Kees the highest of recommendations. Dear Drs Kaldenbach, We wish to thank you so much for the wonderful tour of the Rijksmuseum on Monday. And a special thanks for inviting Denise and Morgan to join in. It made the experience all the more enjoyable. Drs Kaldenbach, I wanted to write to you to let you know that I had a wonderful time on our tour of the Rijksmuseum together with my family. You wanted me to write you with several of my thoughts on the tour, so here they are. Given my background on the subject matter, I thought your presentation about the artwork in the museum was fantastic because you made it clear, concise, and easy to understand. Each painting felt personalized and easy to grasp because you used language that I could relate to and it made the tour more enjoyable. You brought a lot of energy to the tour which kept me engaged and interested in the material as well. I was especially impressed with our discussion of the Vermeer paintings. Your knowledge and passion for the artist was evident and made me fall in love with his works all over again. I hope I have the chance to come back to Amsterdam and take another tour with you! Thank you for sharing your vast knowledge with us yesterday. All of us in the group were impressed with your special connection to the art we examined. What makes you unique in my experience is your ability to break down mysteries into the pragmatic and manageable. The process, the techniques, the reflexion on history, and the business of art then and now are all evident when we seek it. Of course, you look deeper than just about anyone and have discovered treasure after treasure as a result. Quest forth. I hope you will find a publisher for your latest Vermeer work in the coming year.